The following is pulled from the cutting room floor of our upcoming chapter in the edited collection Zombies in the Academy: Living Death in Higher Education. The Undead in the U.S. of A.
Vampires seem to have something going in the Northwest. Maybe there is some truth to the Twilight series! Other than that, it seems there are a lot of zombies and vampires throughout the entire United States. Seems like your best bet is to hunker down in Northern Nevada and wait for them to battle it out. Zombies really have something for the Spanish seashore...while vampires apparently have grown tired of turning to dust in sunny Spain. Both Germany and England seem to be run by vampires which some how seems appropriate given the recent financial restructuring arrangements made for Iceland, Ireland and Greece. Come to think of it, the first map above cleary shows that New York is a center for vampires. So perhaps there is a closer relationship between the parasitic relationship of vampire-human and finance-economy than we first imagined... I always thought bankers looked kinda pale! Be sure to check out the previous iterations of our Preparing for the Zombie Apocalypse series in Parts I, II, III, IV, V and VI. The following is an excerpt of our upcoming chapter in the edited collection Zombies in the Academy: Living Death in Higher Education. Building on our earlier analysis of zombie-related keywords as a way of understanding the geographies of the undead, it is also helpful to return more directly to one of the cultural sources of zombies by mapping references to some of the most important and seminal zombie films: George Romero’s Living Dead series. One of the most noticeable elements on the map of references to the films is that there are many more references to “Day of the Dead” than any of the other film titles. While also the third film in Romero’s series, Day of the Dead is much more notable as a Mexican holiday to commemorate the deceased (Dia de los Muertos). The geography of references to Day of the Dead, in which references are largely clustered in heavily Hispanic areas of the US southwest and northeast, strongly suggests that most references are to the holiday rather than the film. Here again, we observe the ways that online representations mirror material sociospatial practices, including the religious and spiritual practices of Mexican immigrants in the US, even if it was not necessarily intended as the object of focus. 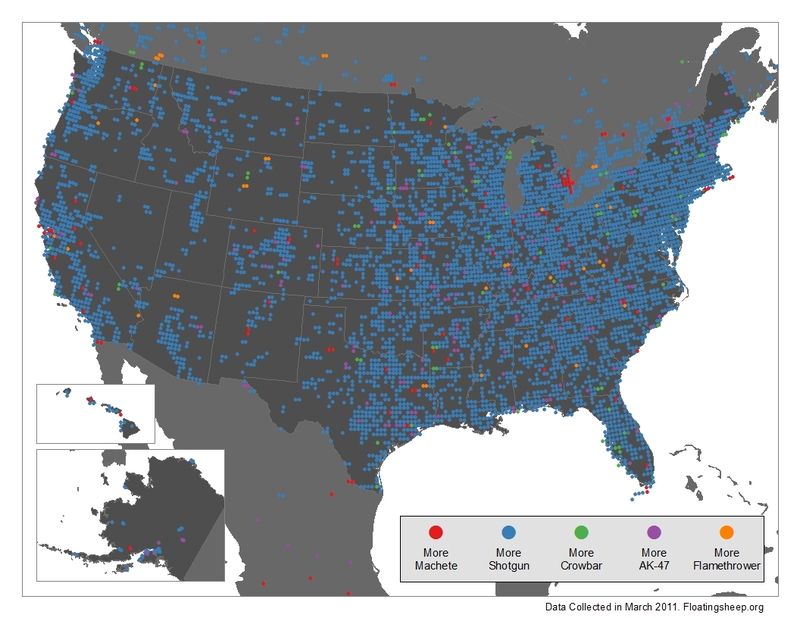 The second discernible spatial pattern is the clustering of references to Dawn of the Dead, with some mentions to the other film titles, in Pennsylvania. This is unsurprising given Romero’s connections to the state and the fact that the film was set and filmed there. This connection (like that of AK-47 references in Eastern Europe) is a useful way of illustrating how cultural artifacts and practices are intimately tied to material places, not just physically, but also in digital reflections of material places. And in this specific case, forming a virtual “zyberscape” of undead references splattering and spotting the cartographic representation of reality. Be sure to check out the previous iterations of our Preparing for the Zombie Apocalypse series in Parts I, II, III, IV and V.
As we try to move our analysis beyond the simple mapping of references to “zombies”, as was shown in Part IV, references to other zombie-related keywords can be particularly revealing of a variety of socio-spatial patterns, whether they be medically related keywords, such as Max Brooks’ fictitious “solanum” virus, or even a comparison between the relative presence of the zombie food source “brains”, as compared to what we presume to be the inverse, “salad”. While these selections are certainly amusing, they provide little insight on the connection between the zombie metaphor in the geoweb and the lived realities of different people. A potentially better line of exploration lies in mapping references to various material artifacts related to zombies, in this case the weapons used to kill zombies in literature and cinema. After all, upon finding out where exactly the zombies are, the next task usually involves getting rid of them. Using the following keywords – “machete”, “shotgun”, “crowbar”, “AK-47” and “flamethrower” – we mapped the relative prevalence of each term across Europe and the US. As is par for the Floatingsheep course, each color dot signifies a point at which there are more references to that keyword than any of the other four weapons. Although this does not take into account the absolute number of references to each keyword, it highlights the dominance of references to any particular weapon and its concomitant cultural implications in a particular place. There are three noticeable spatial patterns visible in the first map. First, a cluster of references to AK-47s exists in the former Eastern bloc countries. Given the weapon’s origin within the Soviet Union, the prevalence of references in Eastern Europe is unsurprising. Second, the dominance of references to shotgun in Great Britain is the most noticeable pattern, especially because it broadly conforms to the boundaries of the island. Third is the fact that most locations within Europe have no references to any of these keywords, a fact that indicates that their usage on the internet, like that of zombies, is concentrated in very particular places. The references to weapons in these maps have the effect of mirroring distinct socio-cultural traits in offline, material practices. The second map, depicting the same keywords mapped across the United States, is, like England, blanketed with references to shotguns. 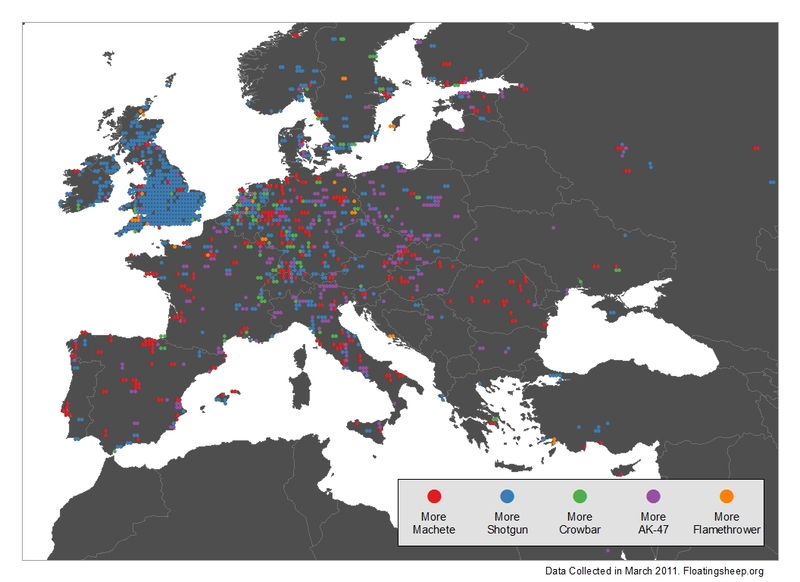 This, compared with the dearth of references to any of these weapons throughout much of Europe, is indicative of a greater degree of the embeddedness of the artifact of the shotgun in the cultural practices (e.g., real or perceived levels of violence), and by extension the virtual representations, of some parts of the world. While not resolving the debate of whether “guns kill people” or “people kill people”, this analysis makes evident that in the event of a zombie horde, shotguns would likely be killing zombies in the British Isles and the USA. On the other hand, continental Europe would likely draw upon a mélange of machetes, crowbars, Kalashnikovs and the occasional flamethrower. Choose your weapons carefully, friends. Be sure to check out the previous iterations of our Preparing for the Zombie Apocalypse series in Parts I, II, III and IV. In our book chapter, "Mapping Zombies", we attempt to discern how the spatial patterns exhibited by geo-coded content are reflective of some underlying social structure. 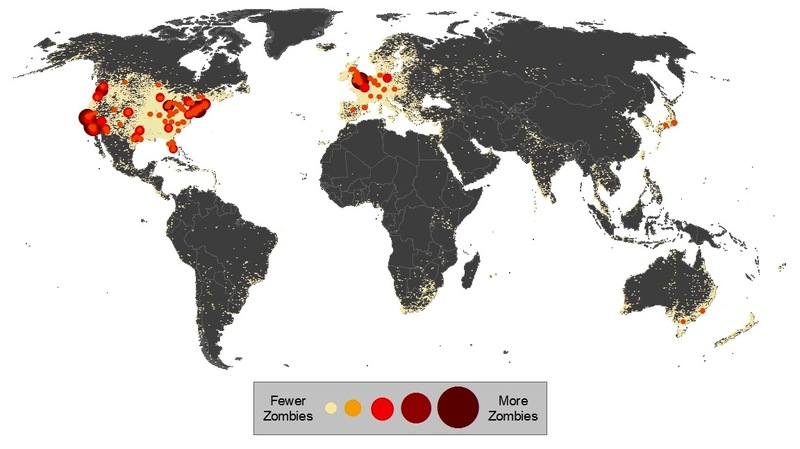 One of the more obvious trends was the concentration of most zombie-related content in just a handful of places -- generally the world's largest Anglophone cities. Using a simple keyword search for “zombies”, the following map visualizes the absolute concentrations of references within the Google Maps database. The map reveals two important spatial patterns worth consideration. First, much of the world lacks any content mentioning “zombies” whatsoever. Second, and related, the highest concentrations of zombies in the geoweb are located in the Anglophone world, especially in the largest cities. The lack of content referencing zombies can likely be explained by two factors: language and socioeconomic inequality. First, because the searches for the keywords were conducted only in English and Latin characters, all references in other languages and scripts are absent. Nonetheless, many non-English speaking countries still had a number of references to zombies, meaning that language cannot be assigned complete causation. Because previous research indicates that socio-economic factors like income and internet access play a significant role in explaining the contribution of online content, it is likely that this accounts for much of the remaining difference. This ultimately means both that much of the world is left out of processes and practices of information sharing and generation, and that content is concentrated in a relatively small number of places rather than ubiquitously distributed across space. Even within Europe and North America (i.e., the parts of the world containing the most zombie-related content), there is a significant concentration of content in just a handful of cities. New York, Los Angeles, San Francisco and London, for instance, contain the greatest number of online references to zombies, a fact that reflects their status as important nodes in the world’s information ecosystems. Information, much like zombies, is attracted to existing centers of activity as part of the historical process of urban agglomeration. As of 2008, the world’s population was evenly divided between those living in rural areas and those living in urban areas. Given the sharp upswing in urban inhabitants through history, that ratio will increasingly favor those who live in cities. Given this oft-cited fact, it is unsurprising that, if we are to accept that zombies are an extension or a representation of society-at-large, references to zombies are clustered in urban areas. Such connections between zombies and urbanism are not unique to the geoweb, as May (2010) has argued that “recent zombie films offer a vision of the city that articulates the corporeality and bodily ambiguity of the zombie simultaneously with depictions of urban space” (285-286). While the cognitive connection between zombies and the city is apparent, what the mere concentration of references cannot tell us is what exactly is being referenced. Each mention of “zombies” could be positive or negative, earnest or facetious, though there is no established way of discerning this context. References to zombies could refer to the location of annual ‘zombie walks’ or a place to buy a children’s zombie costume for Halloween. There seems, however, to be an interesting contradiction in the possibilities for zombies in the city. On the one hand, zombies represent a dystopic future for the city. As one mathematician discovered, a zombie outbreak in a city of 500,000 people would take less than one week to eradicate all non-zombie life (Smith? 2009). Given startling, if still fictitious, statistics such as this, it’s hard not to imagine the city as the locus of the zombie apocalypse in the vein of Bladerunner or any number of books by Mike Davis. On the other hand, the city is something of a safe haven from zombies. The zombie attack in George Romero’s Night of the Living Dead begins in rural Pennsylvania, and the characters in The Walking Dead comic book series take shelter from zombies in the sprawling metropolis of Atlanta, Georgia. This alternative understanding is perhaps more in step with the urban fetishism of some recent scholarship which views cities as the solution to the world’s problems (Glaeser 2011). Ultimately, drawing on our previous post outlining our approach to zombies in the geoweb, it is apparent that there is some important connection between zombies and the city, though we are unsure of what exactly it may be. Nonetheless, the fact that zombies are highly concentrated in only a handful of places is reflective of the importance of cities to society and of those particular cities as command and control centers for the global economy. Gleaser, Edward L. 2011. Triumph of the City: How Our Greatest Invention Makes Us Richer, Smarter, Greener, Healthier and Happier. Penguin Press. May, Jeff. 2010. Zombie geographies and the undead city. Social and Cultural Geography 11(3): 285-298. Smith?, Robert. 2009. A report on the zombie outbreak of 2009: How mathematics can save us (no, really). Canadian Medical Association Journal 181(12): E297-E300. So you're probably wondering why we've resurrected the zombie series... we've got zombies on the brain (get it?! zombies?! resurrected?! on the brain?!). Well, we've just finished a chapter for a book called Zombies in the Academy which is scheduled to be coming out by the end of the year, is edited by Andrew Whelan, Chris Moore and Ruth Walker. Our chapter entitled "Mapping Zombies: A Guide for Digital Pre-apocalyptic Analysis and Post-apocalyptic Survival" is relatively short (3000 words) but intellectually rich -- exactly the kind of material we like to put on FloatingSheep. ...and let's be honest, the past two weeks have been a bit slow with original posts -- almost congealing in a sticky pool of guest maps and Hungarian folk dancing. Zombies exist, though perhaps not in an entirely literal sense. But the existence, even the outright prevalence, of zombies in the collective social imaginary gives them a realness, even though a zombie apocalypse has yet to happen. The zombie trope exists as a means through which society can playfully, if somewhat grimly and gruesomely, discover the intricacies of the humanity’s relationship with nature and the socially constructed world that emerges from it. In this chapter, we present an analysis of the prevalence of zombies and zombie-related terminology within the geographically grounded parts of cyberspace, known as the geoweb. Just as zombies provide a means to explore, imagine and reconstruct the world around us, so too do the socio-technical practices of the geoweb provide a means for better understanding human society. In short, looking for geo-coded references to zombies on the Internet provides insight on the memes, mechanisms and macabres of the modern world. Using a series of maps that visualize the virtual geographies of zombies, this chapter seeks to comprehend the ways in which both zombies and the geoweb are simultaneously reflective of and employed in producing new understandings of our world, albeit with a slightly more references to blood, gore and decapitation than is the norm for academic publications. Just as the zombie metaphor has been deployed in recent years to explain everything from epidemiology to surviving graduate school, neoliberalism to colonialism, even the themes of life, death and resurrection in Christian thought. Needless to say, zombies are a flexible metaphor that can be adapted to explain any number of social phenomena. And while virtual, rather than metaphorical, the user-generated content of the geoweb represents a similarly flexible means of understanding and representing the world. Because this content can be created by anyone connected to the internet, the geoweb is theoretically open to a myriad of representations of the world, creating palimpsests of meaning in these hybrid material/virtual spaces. Due to the mutual constitution of the material and virtual spaces in the geoweb, termed cyberscapes, these virtual representations are often reflective of elements from our material lived realities, albeit often in highly distorted ways. To better illuminate the relationships between the material and virtual, this chapter uses the trope of the zombie as an entry point into debates about the Internet, the spatial diffusion of culture, and the hybridization of online and offline spaces. The undead offer a powerful lens for understanding the spatialities of the information age without the gory details of their material manifestations. By mapping the virtual geographies, or ‘cyberscapes’, of zombies we are able to understand not only the digital and geographic contours of a hugely popular trope, but also the ways that those digital mappings of zombies are reflective of cultural augmentations encoded onto lived, material spaces. In addition, the cyberscapes emerging from the zombie trope itself offers a useful narrative for understanding the ways in which the publics of the Internet produce and reproduce objects of attention and bias and differentially augment lived realities. Things have been a bit quiet as of late at FloatingSheep, but the collective has been collectively traveling -- we'll be starting up some more posts next week. Until that time, it is worth checking out the map below on phone-call geographies from the Senseable City lab at MIT. The New York Times story (from last Sunday) is available here.